Pollen Proofing the Screened Porch! “You don’t know what pollen is until you live in the South.” That’s what people told me when we were moving here but did I listen? Of course not! I used to think that Spring pollen was bad in the Pacific Northwest. We had not only the yellow pollen that left a gauzy film on our cars but at times it looked like it was snowing outdoors with the cottonwood seed hairs drifting through the air. HA! That was amateur stuff compared to the insidious pollen grains that seep right through the screens on the porch and blanket the furniture in a thick yellow veil. It isn’t easily dusted off either. No, it takes a little elbow grease to remove. That’s why Mr. OTN and I decided that this year we were going to POLLEN PROOF our screened porch. Well . . . as pollen proof as you can get anyways. 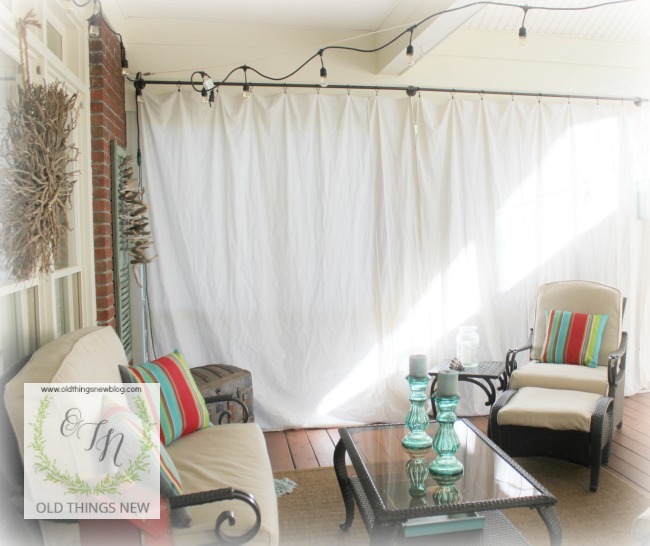 We began by reading all the DIY outdoor curtain posts we could find on Pinterest and then set to work. 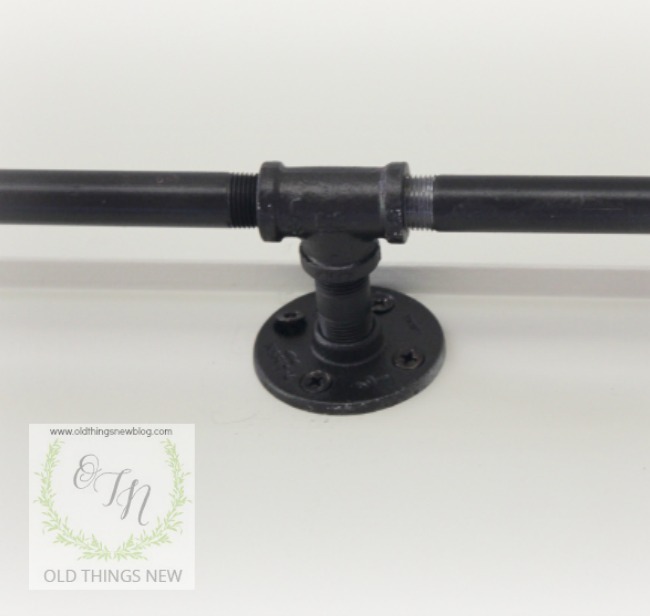 We purchased galvanized plumbing pipe and fittings and spray painted them with Rustoleum’s Oil Rubbed Bronze to prevent rust. You can see in the above photos that the two types of fittings we used were straight and elbow fittings. For the corners we installed decorative brackets for support. We placed curtain clips on the rod before screwing the pipes together. 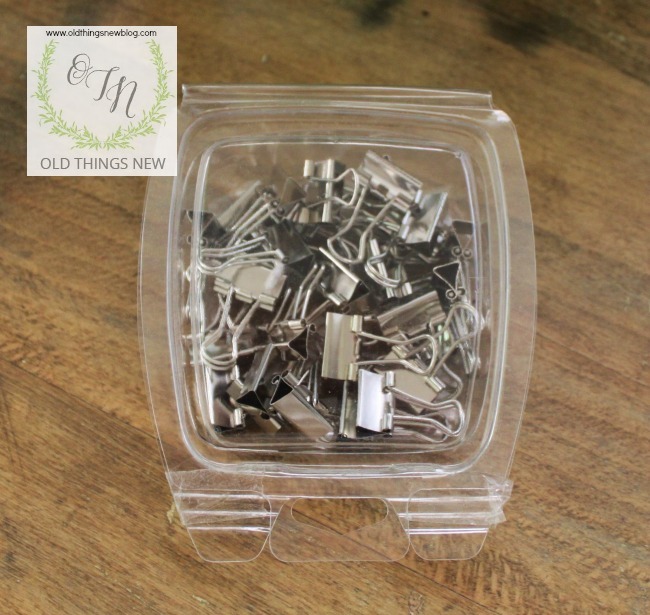 We wanted clips instead of rings for ease of laundering the curtains. These are the painter’s drop cloths that we purchased at Home Depot . . . after purchasing another brand at Lowe’s and finding out that more than half of the drop cloths purchased had horizontal seams through them. Not a good look. In the end these cloths turned out to be a much nicer fabric too and this made me extremely happy. And now some photos of my room with the drop cloths in place. I haven’t hemmed or ironed them yet as I’m still trying to decide what length I want and also considering various ways to weight the bottom. I bought some lead weighted cord but it was extremely lightweight, more for sheers. I also don’t want them so heavy that with a gust of wind they pull off the curtain clips. I’m leaning toward sewing in some simple chain from the hardware store to weight them or maybe nothing at all. We don’t have a lot of heavy wind here and I don’t mind the gentle blowing of the curtains. We did have a windstorm the other day and we simply set our furniture legs on the hems of the drapes. Once pollen season is over we will throw the drapes open wide and enjoy the full view of our backyard. We may even take them down for the summer . . . if we don’t decide to sometimes use this as a sleeping porch. How fun would that be to camp out in our own backyard? We might also find them useful in the chill of late Fall when we can close everything up and bring a heater out to the porch for a little afternoon reading . . .
. . . or even a nap, like Cozy here is considering. 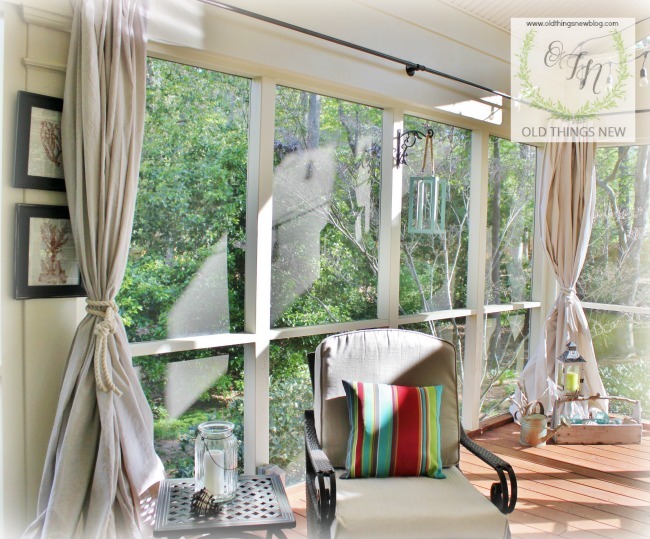 Our screened porch is our very favorite place to JUST BE. By the way, this is what I use to clip the curtains together when they are closed. They hold well and are fairly unobtrusive. And this is what I made to hold them open. You can bet there will be a “how to” post on that later. Where are you spending your time this Spring? Do you have a favorite outdoor place to sit? I know, many places are still experiencing winter so maybe your favorite Spring place right now is beside a fire in a warm den. Wherever you are, I hope you’ll take the time to be still and experience being in the here and now. Thanks for sharing your amazing idea Patti. 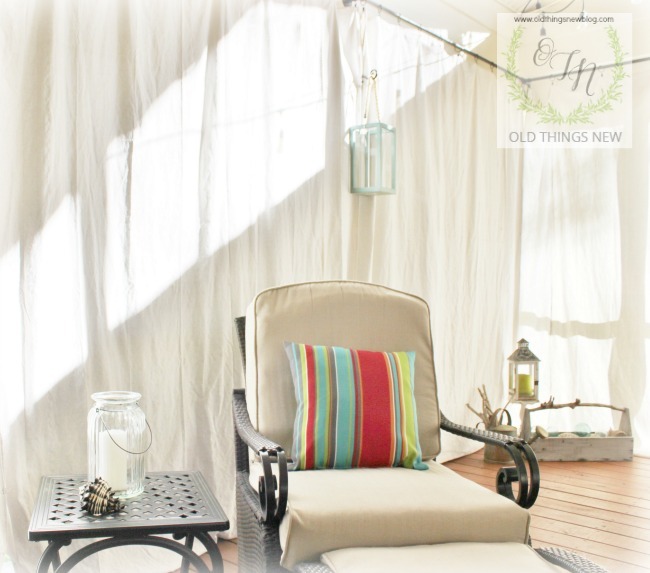 We’ve been thinking about turning our covered deck into a screened in porch and I LOVE the idea of using curtains. The pipe isn’t threaded (only the fittings). Did you have Home Depot thread the pipe for you? Also, did you use the decorative brackets on every corner? I’m trying to figure out how to have a continuation of the pole (rather than adding new floor plates in every corner). What size galvanized pipe? How thick? What a great idea. 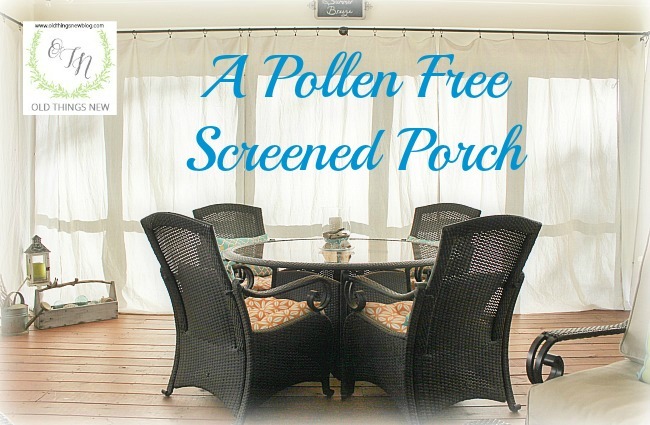 I had a screened in summer porch and was always battling pollen and dust. Wow Patti! I wish I had a Mr. OTN and you at my house. I love how you do all these creative beautiful things. Your porch is wonderful! I’d gladly put up with a little pollen to sit out there with iced tea and a good book. We have an open porch that we are able to power wash to remove all the pollen and grime that always seems to appear in the spring. It’s one of our seasonal tasks. So glad you joined us for Thoughts of Home on Thursday. It’s sweet to have you and your gorgeous home here. Your back porch is so pretty, and the curtains look great! Fabric stores sell drapery weights for the corners of drapes to keep them from swinging around. I don’t know if just in the corners would be enough, but you could always add some along the bottom edge as well as putting them on the bottom corners. Usually they are sewn into the hem of drapes, but I’m sure you could figure out some other way to attach them. Your porch is just beautiful! Our new home will have a screened porch so I am taking notes! What a great idea! And the lightness of them keeps is bright and lovely even when they’re closed! I love this idea. I get the yucky yellow pollen but it lasts all spring and all summer. And also into early fall if it’s still warm. And wouldn’t ya guess, we’re all allergic! This stuff is like yellow SOOT! It’s bad here because we have a farm behind us that grows mostly alfalfa and some flowering plant. And we have open fields and LOTS of trees around. I got new porch furniture over 2 yrs ago and haven’t been able to enjoy it at all. Cleaning the entire porch every time I want to sit takes way too long. I’m going to try the curtains. I wish I could find some waterproof ones. The rain blows into the porch every time. Sitting out there during the rain would be refreshing. Oh girl, you had me at “Pollen-proof”. I have been wanting to make these curtains for my deck any way. So please do an update on how well this works against pollen. AND….. your porch is very similar to mine, which I have been contemplating painting. Yours is gorgeous! Thanks for helping me make up my mind. I can only say one thing — Porch Envy. Ok, not just saying one thing. The galvanized pipe idea is brilliant. And I love those corner braces, very snazzy. I would definitely want to camp out on your porch. I have never had a pollen issue and had no idea it was even a problem. It looks like your found a great solution. You seem to be enjoying your new southern life! Loved this post! thanks for sharing your space with our Thursday Blog Hop! 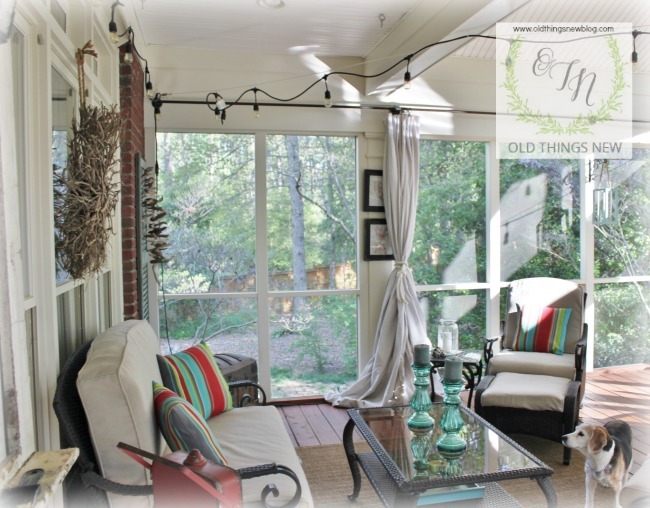 Love love your porch! Thank you for sharing it at SYC! What a great idea! We deal with quite a lot of pollen here in the desert, but certainly not like you have. 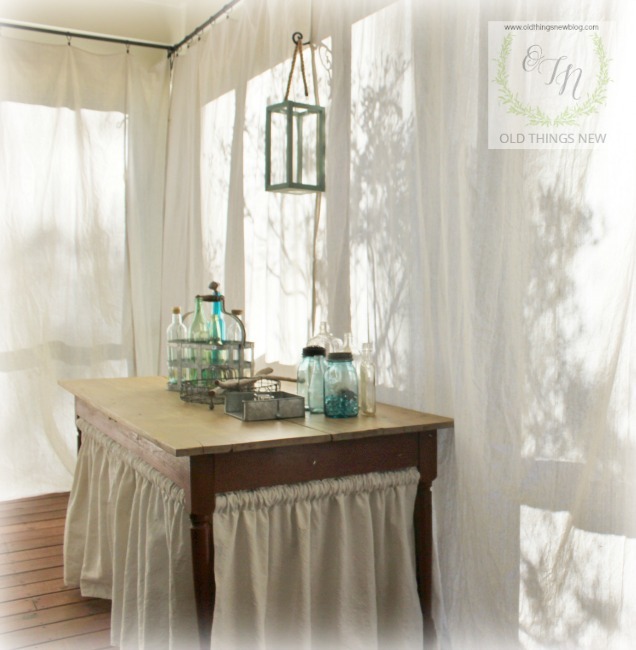 Maria Elena at Our Home Away From Home blog, made some outdoor drapes using drop cloths, too. 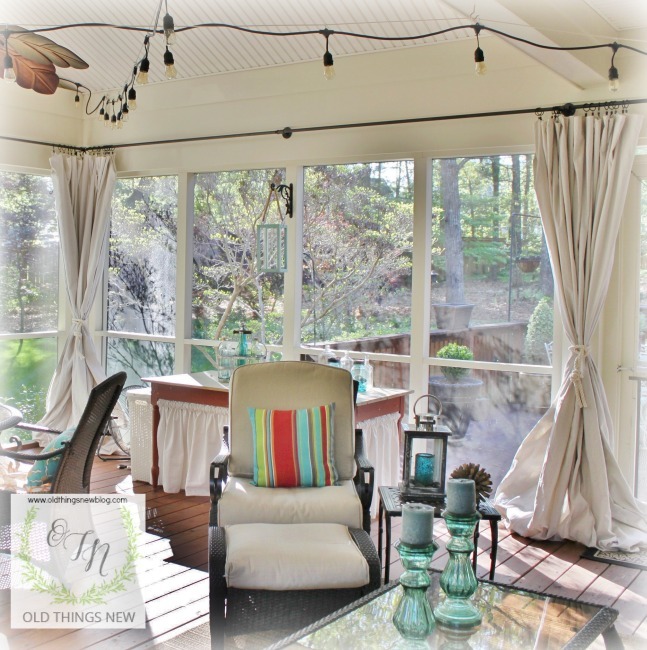 I’m sure you will really enjoy your screened porch now! We spend a lot of time between late Oct. thru May or June on our patio. Part of it is covered, but a large area is open. It’s on the east side of our home, so it’s shaded from 4 o’clock on. I love every detail of this idea! 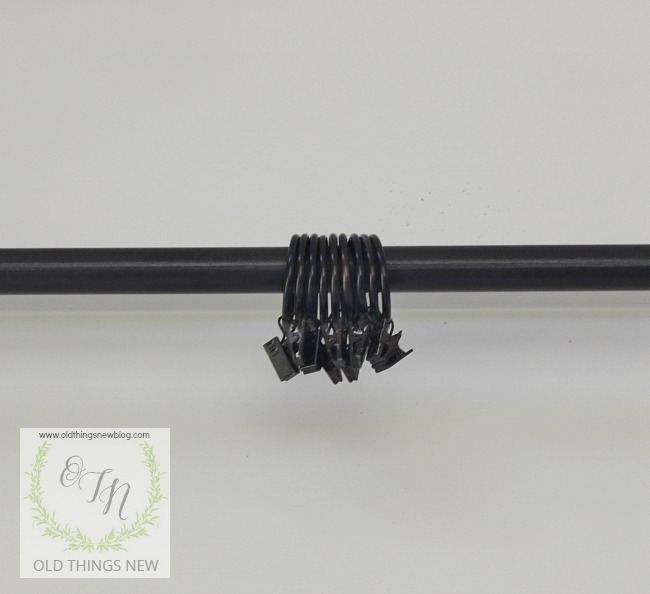 The pipe rods, the tie backs …. it all looks so nice! Well done! 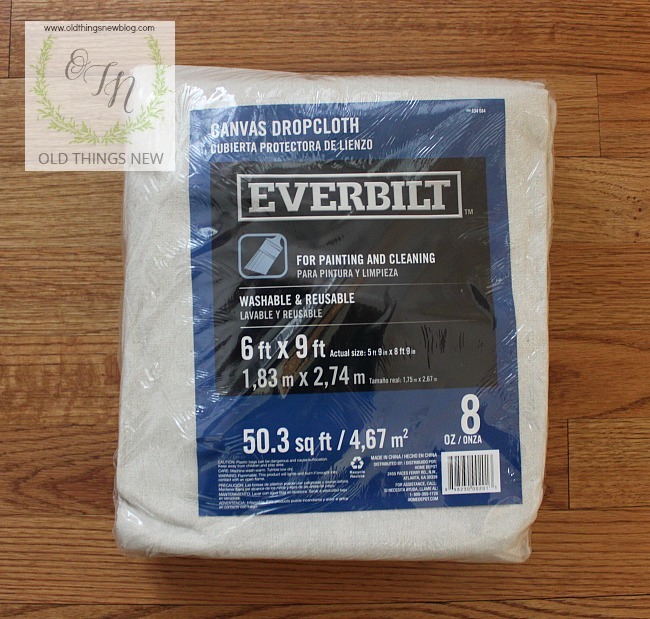 i love the everbuilt brand of drop cloth as well. I usually wash mine a few time first and it gives it a ‘linen’ sort of look and feel. For weighing it down you could also try the weights they put on helium balloons. My friend saves them after weddings or parties to clip onto her outdoor table cloths. I like your idea of sewing in a chain though 😉 I hope you enjoy a lovely weekend on your porch! The pollen can be a real pain! I’m not sure we have it as bad here…or bad enough to completely close off our view & the spring breezes. 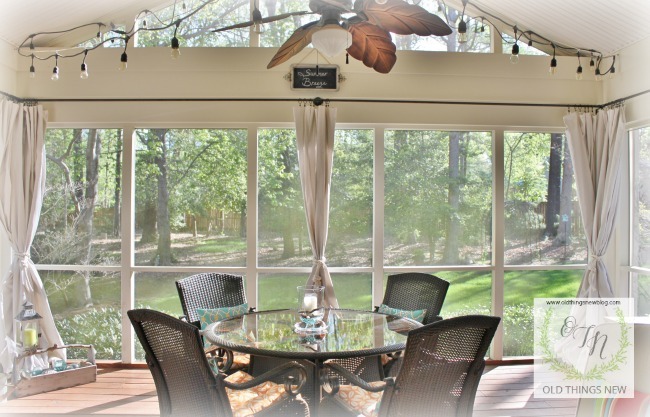 ”Everything on our screened porch is pretty much waterproof so we take the garden hose & wash everything down from ceiling to floor after pollen season. I have been looking at the extra long shower curtains at Bed, Bath & Beyond to block the sunlight. Our porch faces east with beautiful sunrise lake views but by mid-May that morning sun makes it very uncomfortable to enjoy mornings there – our favorite time. Last year I just used an old white sheet to give shade just where we were sitting. It worked very well so this year I plan to make it look pretty with real curtains. I thought shower curtains would be good with the morning dew & spring rains. Patti your drapes are perfection! Our 16 oak trees are just dripping in pollen. Your post is such a happy addition to Thoughts of Home on Thursday. Thank you SO much for sharing the joy. 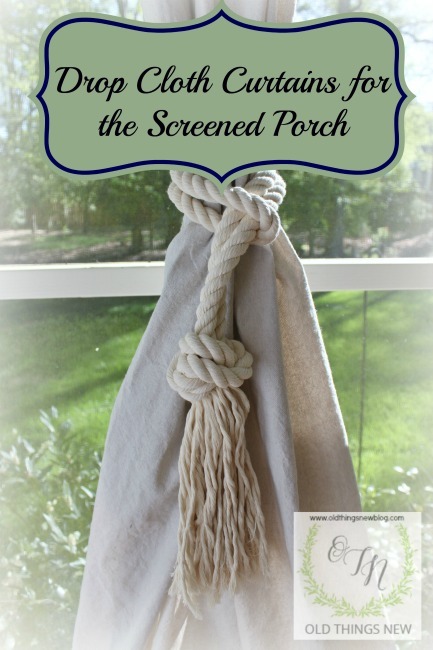 I love the airy look the drop cloths give your porch. I have the drop cloth from Lowe’s and haven’t opened it all the way up yet….not sure I want the weight of it for curtains in my dining room. Now that I see how yours look, I have to go check them out at Home Depot. 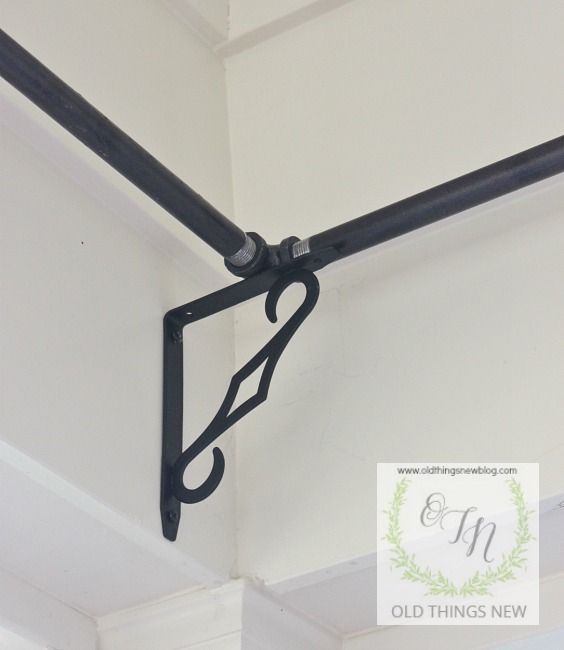 I want to try and make a curtain rod with the clips like yours….I saw that on Pinterest too! 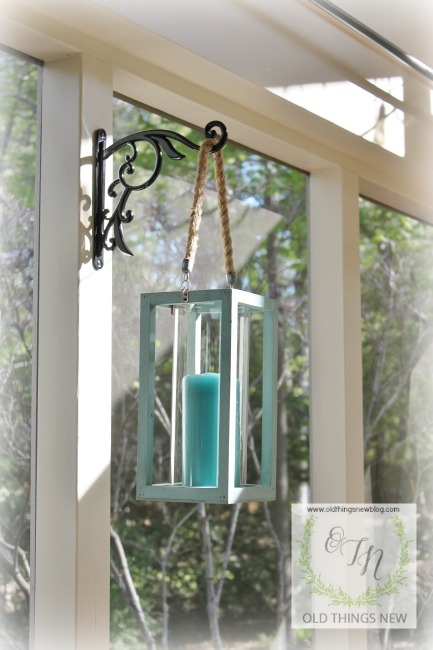 This was a great post for me to see how great it looks in your porch and confirms that it is what I want in my dining room! 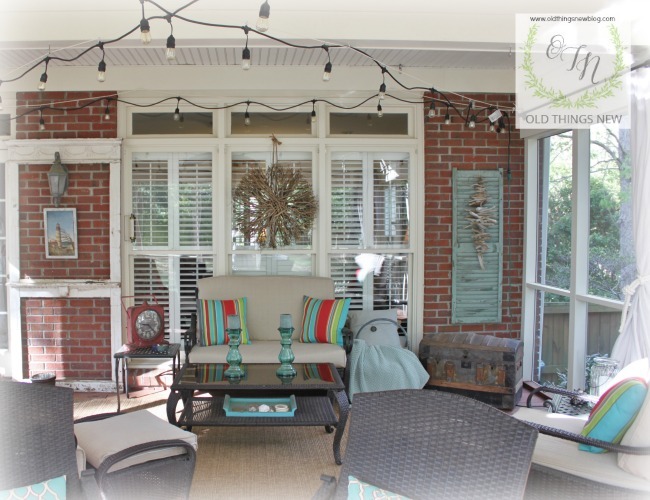 Such a great idea – and your porch is stunning! The trees are just starting here in NJ but my son’s eyes are starting to water so it’s coming. The pollen will be getting bad over the next month or so – ugh. Always fun to wipe that yellow film off of our deck furniture… Enjoy your weekend! I’m just popping in to let you know that your beautiful porch will be featured tomorrow at Making Broken Beautiful. Thank you for the inspiration! I hope you have a wonderful day! Isn’t it AMAZING, Patti! I never would have believed what pollen season could be like until I moved to North Carolina. 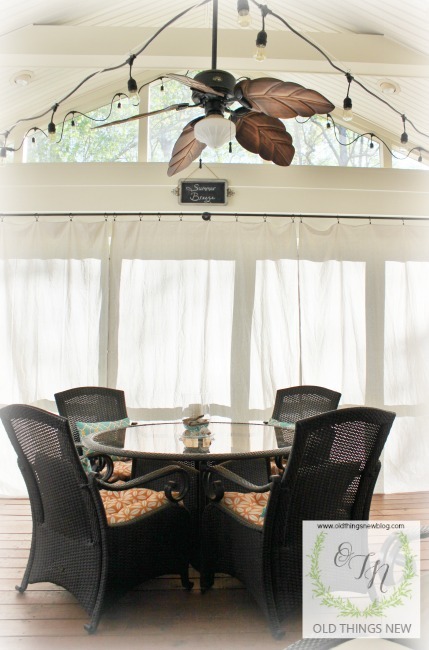 You’re brilliant to come up with a way to keep most of it off your screened porch! Thank you for sharing your great idea. And thanks for joining the Grace at Home party–I’m featuring you this week! How have the clip on rings held up? Any rusting? No holes. 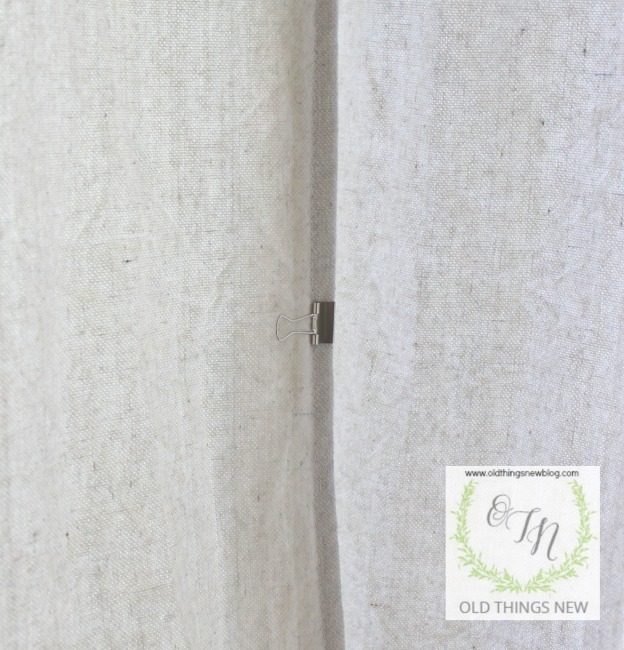 The drapery hooks just clip to the fabric. This makes it easy to take the curtains down and wash them without taking the hooks off the rod. Did you have to cut the pipes to fit the size of your porch? I’m trying to remember the answer to your question Amy. Many hardware stores will cut them for you and add the threading for the attachments but I think we lucked out with the pieces being the perfect lengths. I just blogged just a Mom letting her mom across the country see what I am doing kinda blog! But it worked! I love it.!!! I even did an I tried it on Pinterest(my first). I used one of your photos, and linked back to your blog. If you want I can remove it. 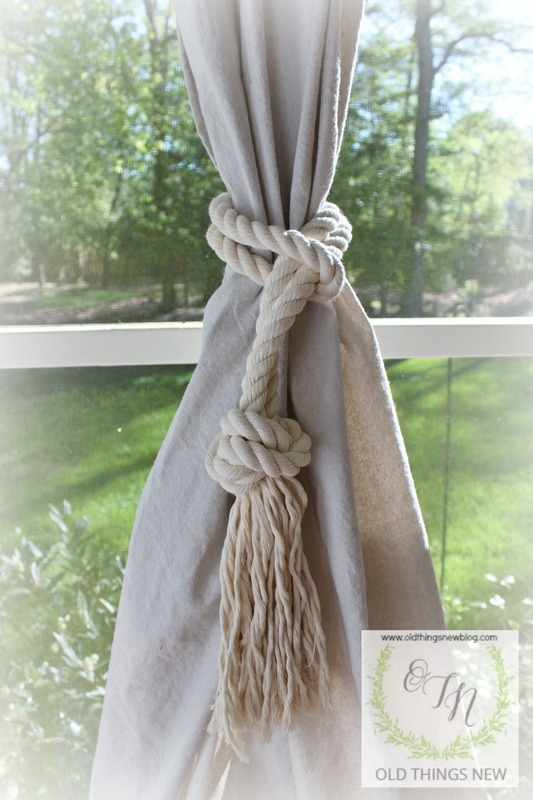 I love your tassel tie backs for your drop cloth curtains. Do you mind sharing how you made them? I am so envious of your screen porch. It’s beautiful and the curtains add so much to the room. I am fascinated by the curtains under the table. I’ve been thinking about adding something similar to an old plain wood computer desk. I want it to look just like yours. You are so sweet Carol. Before we ever moved to the south I said that I wanted a home with a screened porch and that was the first room we looked at in this house. It sold us on it. Thank you for all you wonderful compliments! What did you decided to do as far as hemming or weighing down the bottom of th curtains? How did they end up working last season? Hi! Can you tell me if this really worked to keep the pollen out? I, too, am in the south and need to figure out a way to pollen proof.